Objective: Phycocyanin is a pigment found in blue-green algae which contains open chain tetrapyrroles with possible scavenging properties. We have studied its antioxidant properties.¶Materials and methods: Phycocyanin was evaluated as a putative antioxidant in vitro by using: a) luminol-enhanced chemiluminescence (LCL) generated by three different radical species (O− 2, OH•, RO•) and by zymosan activated human polymorphonuclear leukocytes (PMNLs), b) deoxyribose assay and c) inhibition of liver microsomal lipid peroxidation induced by Fe+2-ascorbic acid. The antioxidant activity was also assayed in vivo in glucose oxidase (GO)-induced inflammation in mouse paw.¶Results: The results indicated that phycocyanin is able to scavenge OH• (IC50 = 0.91 mg/mL) and RO• (IC50 = 76 μg/mL) radicals, with activity equivalent to 0.125 mg/mL of dimethyl sulphoxide (DMSO) and 0.038 μg/mL of trolox, specific scavengers of those radicals respectively. In the deoxyribose assay the second-order rate constant was 3.56 × 1011 M−1 S−1, similar to that obtained for some non-steroidal anti-inflammatory drugs. 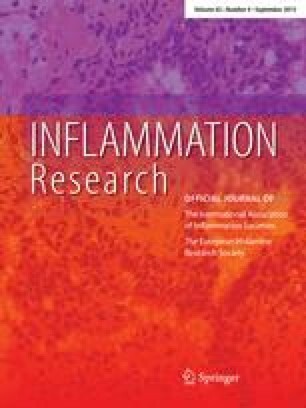 Phycocyanin also inhibits liver microsomal lipid peroxidation (IC50 = 12 mg/mL), the CL response of PMNLs (p < 0.05) as well as the edema index in GO-induced inflammation in mouse paw (p < 0.05).¶Conclusions: To our knowledge this is the first report of the antioxidant and anti-inflammatory properties of c-phycocyanin.